How do disinformation campaigns use social media to spread their messages? 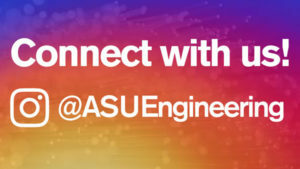 Nitin Agarwal, Distinguished Professor of Information Science at the University of Arkansas at Little Rock and Fulton Schools’ Professor Huan Liu will discuss the science behind sharing information over social media. Although social media use is generally benign, such platforms can be used to disseminate propaganda, hoaxes and fake news to influence the public. The availability of inexpensive and ubiquitous mass communication tools has made such malicious activity much more convenient and effective. This talk demonstrates how disinformation campaigns work, examine the critical link between blogs and other social media platforms and the different media orchestration strategies. Using socio-computational models that leverage social network analysis and cyber forensics, prominent information actors and leading coordinators of disinformation campaigns are identified. 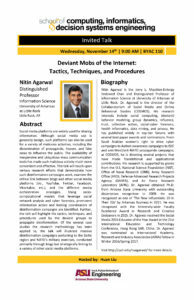 Further, the talk highlights the tactics, techniques and procedures used by the deviant groups to propagate disinformation. Of the several case studies the research methodology has been applied to, the talk illustrates massive disinformation campaigns pertaining to the Baltic region and NATO’s military exercises. Nitin Agarwal is the Jerry L. Maulden-Entergy Endowed Chair at the University of Arkansas at Little Rock and serves as the director of the Collaboratorium of Social Media and Online Behavioral Studies. His research interests include social computing, deviant behavior modeling, group dynamics, influence, trust, collective action, social-cyber forensics, health informatics, data mining and privacy. From Saudi Arabian women’s right to drive cyber campaigns to Autism awareness campaigns to ISIS’ and anti-West/anti-NATO propaganda campaigns, he is directing several projects that have made foundational and applicational contributions. Agarwal obtained his doctorate from Arizona State University with outstanding dissertation recognition in 2009. Agarwal received the Social Media 2015 Educator of the Year Award at the 21st International Education and Technology Conference, Hong Kong SAR, China. He was also nominated as International Academy, Research and Industry Association Fellow in Winter 2016/Spring 2017.